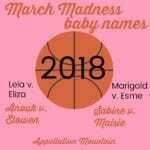 We’re one more week in March Madness baby names 2018, which means it’s time for the Girls Semi Finals. One of the QuarterFinal matches surprised me. Another one was expected – but oh golly, did the winner win big! It’s always fun to see which names really appeal when you’re forced to make a choice between just two options. I think I have a guess for the girls’ winner. (Maybe you do, too!) It’s so different from the boys’ contest, which feels completely up-in-the-air. Her Royal Highness General Leia fell to My Fair Lady Eliza. 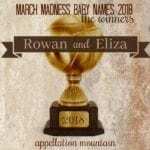 That’s not a surprise necessarily, but the percentages are staggering: Eliza swept up 73% of the vote! 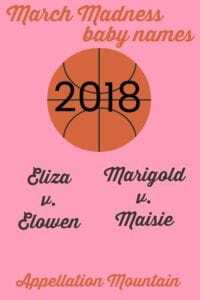 I didn’t know which way the Marigold versus Esme match-up would go. But you voted Marigold up, 60% against Esme’s 40%. I had Esme pegged as a possible winner after the opening round, so that one stunned me. Maisie topped Sabine, 57% to 43%. Maisie really is a rising favorite. The two rarest names on the list made for a tough contest to call. 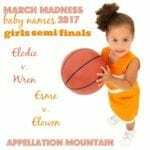 But Elowen, a long-time Appellation Mountain reader favorite, garnered 62% of the vote, against Anouk’s mere 38%. 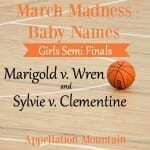 And so we move on to our SemiFinals, where two E names and two M names battle it out for the right to advance to the Final Round. I know the two names I think will make it to the finals, but it’s not up to me – this one is up to you. Please vote! 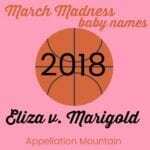 El- names feel unstoppable, from Top 20 Ella to classics like Elizabeth. Eliza, of course, is that regal name’s sassier sister, a short form that stands on its own. It’s got history galore, from Audrey Hepburn’s unforgettable character in My Fair Lady to nineteenth century First Lady Eliza McCardle Johnson. Elowen is different. A Cornish import, it means elm tree. It’s a modern nature name, the equivalent of River or Willow in English. But they both have tremendous appeal. In fact, they’ve both appeared in prior March Madnesses, as far back as 2012. Vintage Maisie fits right in with Sadie and so many comeback choices finding favor today. The name rose after Henry James’ 1897 novel What Maisie Knew became a movie in 2012, re-entering the US Top 1000 in 2014. It’s big in the UK, too. Downton Abbey gets credit for Marigold’s higher profile. For now, the name remains comfortably outside the US Top 1000, suggesting that it will be at least a few years before we hear it as often as Violet. That makes both M names choices that seem antique, but are actually enjoying newfound heights of popularity. Which do you prefer? Voting will remain open through Thursday, March 22nd. Check back on Saturday, March 24th to see which two names advance to the Final Round!